It's got avatars, chat, and premium songs, oh my! 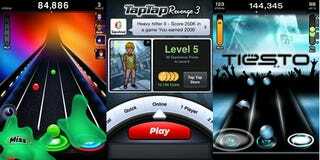 Soon-to-be-released Tap Tap Revenge 3 focuses on the social side of things, and it looks like it might pull it off well. Or maybe I'm just giddy about the Tiësto tracks. Avatars and chat are the key to Tap Tap Revenge 3's social side. The game is boasting hundreds of avatar items to truly personalize your lil' character though we'll see just how customizable the avatars are when I'm pouting over the lack of a "frizzy hair" option. The screenshots of the chat lobby and personal messages are reminding me of some earlier Twitter apps, so that might turn out quite well. Aside from the pure awesomeness of the Tap Tap Revenge series, this version will be extra awesome because it is among the first iPhone apps to take advantage of the App Store's in-game commerce capabilities. Meaning that you can make purchases through the game, using your iTunes account. BLINK 182 - "Adam's Song" / "All the Small Things" / "Dammit" / "First Date" / "The Rock Show" / "What's My Age Again"
FALL OUT BOY - "Thanks for the Memories" / "Sugar, We're Goin Down" / "Dance, Dance" / "This Ain't a Scene, It's an Arms Race" / "I Don't Care" / "American Suitehearts"
FOO FIGHTERS - "The Pretender" / "Wheel" / "My Hero" / "Best of You" / "Monkey Wrench" / "All My Life"
THE KILLERS - "Mr. Brightside" / "Sweet Talk" / "Human" / "When We Were Young" / "All These Things That I've Done" / "Read My Mind"
NO DOUBT - "Ex-Girlfriend" / "Don't Speak" / "Hella Good" / "Just A Girl" / "Spiderwebs" / "Hey Baby"
SMASHING PUMPKINS - "Tonight" / "Cherub Rock" / "Bullet with Butterfly Wings" / "Today" / "Tarantulla" / "1979"
TIËSTO - "Fresh Fruit" / "Ten Seconds to Sunrise" / "Driving To Heaven" / "Knock You Out"(feat. Emily Haines) / "Lethal Industry" / "Carpe Noctum"
A PERFECT CIRCLE - "Judith" / "Weak and Powerless"
AFI - "Miss Murder" / "Girls Not Grey"
AIRBORNE TOXIC EVENT - "Sometime Around Midnight" / "Wishing Well"
THE ALL AMERICAN REJECTS - "Gives You Hell" / "Move Along"
ANGELS AND AIRWAVES - "The Adventure" / "Everything's Magic"
ASHER ROTH - "I Love College" / "Lark on My Go-Kart"
BUSH - "Machinehead" / "Glycerine"
COLDPLAY - "Lovers in Japan" / "Viva La Vida"
THE CRYSTAL METHOD - "Busy Child" / "Keep Hope Alive"
GODSMACK - "I Stand Alone" / "Whatever"
GWEN STEFANI - "Hollaback Girl" / "Sweet Escape"
BEN HARPER - "Steal My Kisses" / "Keep It Together (So I Can Fall Apart)"
HINDER - "Better Than Me" / "Lips of an Angel"
JANE'S ADDICTION - "Superhero" / "Just Because"
JET - "She's a Genius" / "K.I.A." JET - "Blackhearts (On Fire)" / "Start the Show"
KORN - "Coming Undone" / "Twisted Transistor"
LADY GAGA - "Love Game" / "Poker Face"
LMFAO - "I'm in Miami Trick" / "Bounce"
LYNYRD SKYNYRD - "Sweet Home Alabama" / "Freebird"
MARILYN MANSON - "Beautiful People" / "The Dope Show"
MAROON 5 - "This Love" / "Makes Me Wonder"
MEGADEATH - "Peace Sells" / "Wake Up Dead"
MICHAEL FRANTI / SPEARHEAD - "Say Hey I Love You" / "Bomb The World"
MORGAN PAGE - "The Longest Road"(Deadmau5 Remix- Radio Edit) / "Fight for You"
NINE INCH NAILS - "Closer" / "Hurt"
NINE INCH NAILS - "The Hand That Feeds" / "Only"
ONE REPUBLIC - "Apologize" / "Stop and Stare"
PHOENIX - "1901" / "Lisztomania"
QUEENS OF THE STONE AGE - "No One Knows" / "Little Sister"
RISE AGAINST - "Audience of One" / "Ready to Fall"
SNOW PATROL - "Chasing Cars" / "Shut Your Eyes"
SOCIAL DISTORTION - "Far Behind" / "Story of My Life"
SUM 41 - "In Too Deep" / "Fat Lip"
KEITH URBAN - "Kiss a Girl" / "Sweet Thing"
WEEZER - "Hash Pipe" / "Beverly Hills"
WEEZER - "Buddy Holly" / "Troublemaker"
ROBBIE WILLIAMS - "Let Me Entertain You" / "Angels"
Overall it looks like the game itself is getting some great updates, but I'm not entirely sure I'll be willing to purchase extra tracks. Though who knows. One or two are kinda tempting.